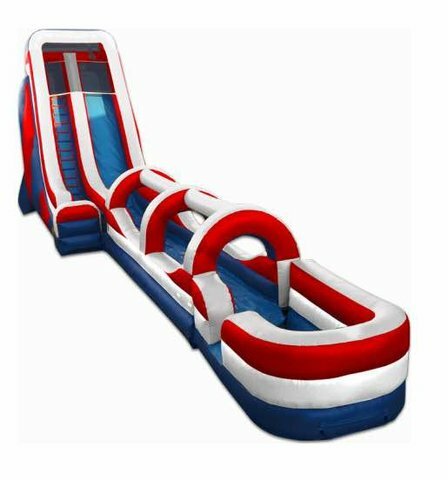 The Slide N' Splash with Detachable Pool is a wet/dry slide any indoor even or warm outdoor party as a great way to cool off. This wet/dry slide allows riders to climb 14 feet to a No-Jump Top, which forces players to slide down correctly, keeping them secure. Kids climb up a right-sided climb to a wide left-sided slick slide, into an oversized, safety-ended pool that detaches, making the transition from a dry to wet slide quick and easy. A brightly-colored theme completes the Slide N' Splash look, ready to fit in to any celebration. This wet or dry slide is just one of the many amazing inflatable slides from Ninja Jump. The Slide N' Splash dual wet/dry slide is a great way to promote enjoyable and healthy activity, and will add excitement and value to any indoor or outdoor event! With a variety of colors, shapes and themes, the slides from Ninja Jump offer kids of all ages endless amounts of aerobic activity. Our slides are made safe and secure with lite n strong™, fire-resistant vinyl making it safer, portable and more durable.